The BJP government in Himachal has delivered on its poll promises and would win both Rohru and Jawali seats where byelection are being held, stated Satpal Jain here before the media. 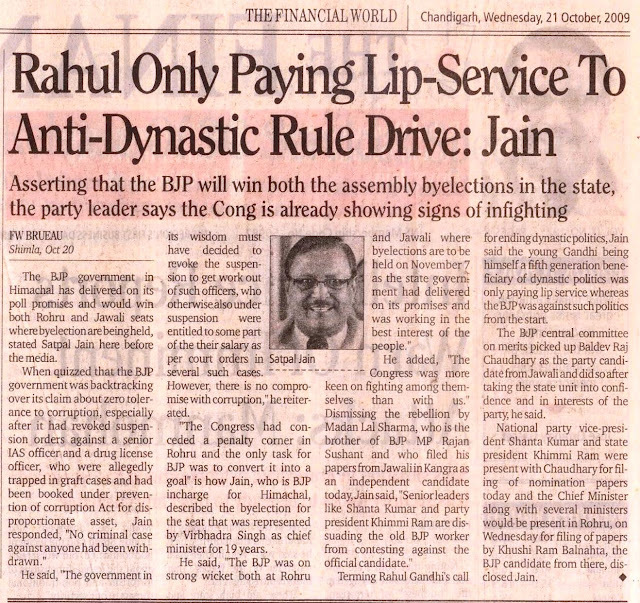 ...Terming Rahul Gandhi's call for ending dynastic politics, Jain said the young Gandhi being himself a fifth generation beneficiary of dynastic politics was only paying lip service whereas the BJP was against such politics from the start. The BJP central committee on merits picked up Baldev Raj Chaudhary as the party candidate from Jawali and did so after taking the state unit into confidence and in interests of the party, he said. National party vice-president Shanta Kumar and state president Khimmi Ram were present with Chaudhary for filing of nomination papers today and the Chief Minister along with several ministers would be present in Rohru, on Wednesday for filing of papers by Khushi Ram Balnahta, the BJP candidate from there, disclosed Jain.